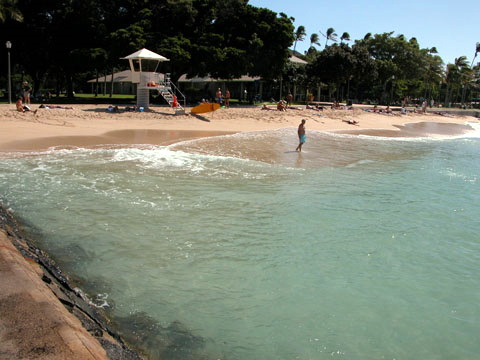 Kapiʻolani Beach Park occupies most of shore that borders Kapiʻolani Beach Park. This steep, narrow beach has generally very small waves and a lifeguard tower, making it ideal for less experienced swimmers. The offshore reef, groins, and seawalls may be sharp and dangerous and should be approached with caution. The beach narrows to the east, and is backed by a seawall and walkway.